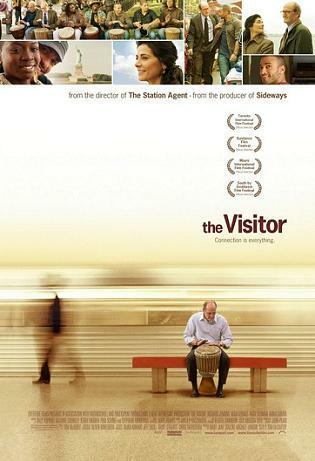 Thomas McCarthy writes and directs The Visitor, a smart, funny and tender drama about Walter Vale (Richard Jenkins), a college professor who returns to his New York City apartment where he finds an immigrants couple, Zainab (Danai Gurira) and Tarek (Haaz Sleiman), living there. As Tarek teaches him African drumming, they both gradually develop a unique friendship. Soon enough, Tarek gets thrown into a detention center for illegal immigrants and Walter desperately tries to free him before they deport him. Hiam Abbass plays Mouna, Tarek's loving mother who also develops a bond with Walter. Thomas McCarthy has previously written and directed the brilliant indie gem The Station Agent, where he also deftly blended drama and comedy with many moments of poignancy. I had the privalege to interview Thomas McCarthy. Overture Films releases The Visitor on April 11th, 2008 at Lincoln Plaza Cinemas and Landmark Sunshine Cinema. NYC MOVIE GURU: What inspired you to write and direct The Visitor? TM: When I was finished The Station Agent, the State Department called me one day and asked, “What do you think about traveling with this movie?” I thought they were joking. They said, “We want to send you out into the Middle East as part of an outreach program to show a different side of America. They sent me to [Iran] and Lebanon to screen the movie. I had a terrific time in Beirut and made really wonderful friends. I worked with a group called Beirut DC, which is a film collective. I really hit it off with them and ended up going back work with them in preparation for the Beirut Film Festival. I had a wonderful personal experience [there] and that’s what I normally connect to in a story. NYC MOVIE GURU: How did you come up with the character of Tarek? TM: I thought I’ve never seen a character like Tarek on screen before, especially now where there’s a lot of various representations of Arab characters, many of them negative in American cinema and television. I wanted Tareq to be an artist of some sort. I felt that that would be a little more cinematic and active. [Also], I wasn’t trying to make a political statement [with The Visitor]; I thought I could really find a fun character here—some one who’s just engaging. That’s where the character of Tareq came from. NYC MOVIE GURU: What about the character of Walter Vale? TM: I had the character of Walter Vale kicking around in my head for a long time. [He’s] a, sort of, shut-down, burned-out, aging economics professor at a mid-level university. I had read something about apartment scams in New York and morphed it into my version and it was off and running. NYC MOVIE GURU: Why did you choose Richard Jenkins as Walter Vale? TM: Richard Jenkins is one of the most versatile character actors that I know working today. He’s one of the few actors who can go from doing a film like The Visitor to doing a film with John C. Reilly and Will Ferrell, Step Brothers. I knew he had the chops—he came from theater. There was no question in my mind that he had the depth and drama in him to pull this role off. Even if you watch his comedy, it always comes from something grounded and serious, which is what makes it so damn funny. It’s not like he’s goofy like Jim Carrey. I also wanted him because he was a little bit faceless like an everyman. If you did recognize him, you’d walk right by him. TM: I had one Homeland Security agent that I would talk to. I spent a lot of time visiting detention centers. There was this one guy who was overseeing a Nigerian guy who was visiting for about 7 or 8 months before he got deported. In the course of that time, I got to know his homeland security agent because I was trying to help him out and figure out his case a little bit. He was a really decent guy. He believed in America and was trying to do his job. I would just talk to him. I rarely lead on that I was making a movie when talking to people like [him] because you don’t want to put pressure on them. One day, I was riding with Sojourners, a non-denomination outreach program, and there was, literally, a Hassidic Jew from Brooklyn and a middle-aged black woman from New Jersey and a Swedish woman who was studying abroad here. It was the funniest combination of people lending their time just to go out and sit with people and talk to them. It’s one of those times I was like, “This is one thing this country does well: it gets people together, in many instances, for a good cause.” I get the detention center and we’re filling out our forms and the woman behind the glass, much like you see in The Visitor, was suddenly like, “Excuse me? Are you in television?” and the guy right next to me turns to me and says, “Are you? Why didn’t you mention that right out in the van?” It was a very funny moment. NYC MOVIE GURU: How did the actors contribute to the details of the script? TM: Richard [Jenkins] came to me one day, “What if I came back from Connecticut today and wore different glasses?” and I was like, “That’s a horrible idea,” and he’d be like, “Well, try these. And what about these?” We did that for a week and then, one day, he showed up with the frames that he actually wears and he said, “What about these?” and I said, “Now that’s interesting! Let’s try it!” It became one of my favorite moments when he returns from Connecticut and has new glasses and Mouna comments on them. I [also] give Haaz [Sleiman] credit. When I told him to do research, play the drums, learn everything you can, he watched a [music] documentary and said, “Wow! This is crazy. The guy sits around in his underwear smoking pot and drumming.” I was like, “That’s hilarious! We have to have you drumming in your underwear.” It became another favorite moment of mine. NYC MOVIE GURU: How did you allow The Visitor to avoid becoming preachy? TM: I guarantee that there’ll be people who’ll be like, “It’s liberal propaganda preachiness.” In this country, if you raise anything that says a little bit about this country, people are like, “Oh, I don’t even have to see it! I know what he’s telling me!” [However], there really isn’t any [preachiness] in there. The way I did that was just relaying what the experience was like of the people involved and what information they would have. So, they’re not speechifying. The closest we have to any kind of speech is Mouna’s reaction at the end when she admits to something and then just talks about her personal experience. That comes from talking and, more importantly, listening to a lot of people. NYC MOVIE GURU: Do you think there’s a practical way to solve the problem of how the U.S. government handles immigration? TM: I don’t think we can. I’m not nearly qualified to answer that question, [though]. Immigration is a ridiculously complex issue. I do think that it goes beyond anything political. It’s a natural human instinct to migrate which has been happening since the dawn of time. In this country, from what I’ve witnessed specifically in visiting the detention centers, is not that we don’t have to deal with it in a way that’s responsible to the citizens of this country and of the world, but in approaching the issue, we do it while remembering that there are human beings on both sides. Let’s make sure we really understand these human beings and see them first and foremost as human beings. Before we lock up 400 people without legal representation in a converted warehouse in Queens, let’s ask ourselves, “Is this the best way?” My father is a very conservative guy, [but] we differ politically. I brought him to one of these detention centers. He just looked to me and said, “This isn’t right. We have to do better than this.” For me, that says it all.